Pakistani troops have violated ceasefire over 25 times along the Line of Control in Jammu and Kashmir since the September 29 surgical strikes by Indian Army in Pakistan-occupied Kashmir to destroy terror launch pads. "There have been over 25 ceasefire violations by Pakistani troops along the LoC in Jammu and Kashmir after the surgical strikes," a senior army officer said. The major ceasefire violations took place on 3, 4 and 5 October along the Line of Control in Jammu region. On October 5, Pakistani troops violated ceasefire thrice and resorted to heavy firing and mortar shelling to target several Indian posts and civilian areas in three sectors in Poonch and Rajouri districts of J-K, provoking retaliation by the Indian Army. Three soldiers had suffered minor injuries, while nine Pakistani armymen were injured in the retaliatory action by India. On October 4, Pakistani troops targeted 10 forward areas with mortar shelling and firing with five ceasefire violations on Indian posts and civilian areas along the LoC in four areas of Jammu, Poonch and Rajouri districts. They shelled mortar bombs and opened small and automatic weapons in Jhangar, Kalsian, Makri in Noushera sector of Rajouri district and Gigriyal, Platan, Damanu, Channi and Palanwala areas of Pallanwala sector of Jammu district and Balnoi, Krishnagati in Poonch district. One jawan had sustained injuries in the action. On October 3, Pakistani troops violated ceasefire four times and restored to heavy firing and mortar shelling in Saujian, Shahpur-Kerni, Mandi and KG sectors in Poonch district, where five civilians were injured and several shops set ablaze after a shell triggered fire in oil containers in a security force camp. On October 2, Pakistan resorted to firing and shelling from 19:15 hours along LoC in forward areas in Pallanwala belt of Jammu district. On October 1, Indian posts and civilian areas were shelled with mortar bombs, RPGS and HMGS amid small arms firing along LoC in Jammu sector. 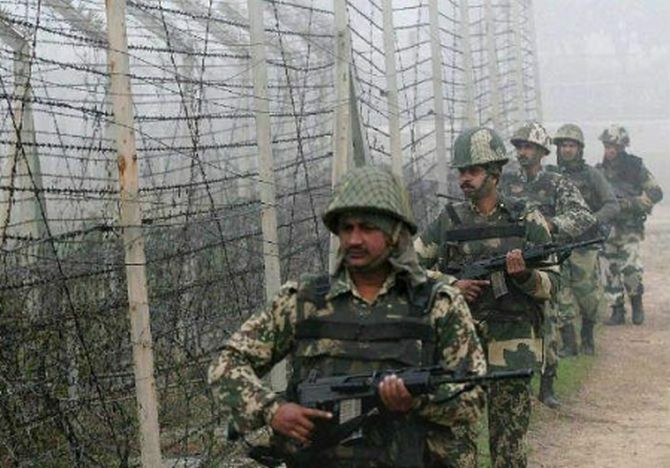 On September 30, Pakistani troops had opened fire from small arms along the LoC in Pallanwala, Chaprial and Samnam areas of Akhnoor sector of Jammu district. Will military action teach Pak a lesson?